The goal of the Kalida Fish and Game is to promote the conservation and restoration of natural resources and the environment. We are a non-profit organization established in 1966. At the very beginning meetings were held above the post office in Kalida. It became clear that Kalida Fish and Game needed it's own building. So in June 1988 a clubhouse was built on St. Rt. 694. Our property features a 200 yard gun range with targets at 25yd, 50yd, 100yd and 200yd. 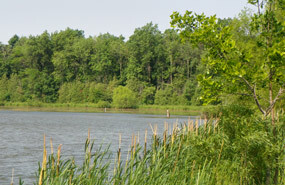 We also have 3 fishing ponds that are stocked full of fish natural to our region. Fish must be 11 inches to keep and no gas motors or swimming is permitted in the ponds. Our on-site rental hall is very large and can be rented for your family gathering, graduation party or reception of any kind. Please CLICK HERE to download the clubhouse rental agreement. In August of 2011 a large addition was built on the back of the clubhouse. 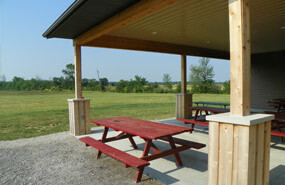 It offers a covered patio with plenty of picnic tables, perfectly situated to enjoy the outdoor scenery. The Kalida Fish and Game currently owns 117 acres and has 500 members. 2018 Gun Extravaganza - Early Bird Drawing - Sunday March 4, 2018. There were 10 $100 winners, see the complete listing of winners on the Gun Extravaganza event page. To help at any of our events, please call 419-532-3782 . Click the link below to print the clubhouse rental agreement.